This fly is one I developed because I wanted a pink emerger. You see a lot of pink among steelhead flies because of the pink in a Rainbow trout’s coloring. The color is common in saltwater flies because it occurs naturally in saltwater bait, notably shrimp and squid. The Pink Lady and Pink Ghost streamer flies have been popular here for years and our own editor, Paul Reynolds, showcased a pink Gifford Stevens fly a few months ago. I’ve even added pink deer hair to bucktail streamers and seen an increase in strikes, probably because the pink looks like diluted blood flowing from a wound. The point? Every single one of those flies has a great track record. I chose an emerger pattern because it’s my favorite fly to fish small ponds with. I spent my youth in western Maine fishing for brookies with wet flies and I prefer that above any other pastime. When my brother in law Alan Stevens of Starks invited me to fish a western Maine pond I brought the pink creation along to try out. As they say, the fishing was good but the catching was a bit slow. We caught several trout in the ten-inch class but none of the 19-20” fish Alan had caught and released on previous trips. A ten-inch trout on a fly rod is tremendous fun but we were working a bit hard even to catch them. The rises we saw were not the feisty splashes or gentle sips of trout taking on the surface rather more like the swells of trout grazing on something just under the surface. Alan had been fishing dries and I had on a very small marabou wing streamer. I switched to the pink-bodied emerger and had five fish to the net in as many minutes. My companion decided that he would like to try the fly and he too began to take fish. My largest was 13” but I had one on that forced the rod into a tight bend and then turned the canoe. I never saw him but I know where he lives now. My choice of dubbing for the body was Spirit River brand because it was mixed with some Antron to give it some shine. To me, the shine looks like air bubbles on the side of an emerging insect. I used peacock herl as a rib because I wanted something besides the usual tinsel. I’ve always liked peacock herl and I think it works well on this fly. I use two herls and I recommend you twist them around some thread to give some strength to the herls. Otherwise, after a couple of trout the fragile herl will be torn off. The hackle is the red body feather from a Golden Pheasant. I like the dark red-brown of these feathers and the fiber length was perfect for the size eight emerger. You can buy a complete body skin of these plentiful birds cheap. Strip one side of the hackle fibers off the stem before you wind it on. This will preserve the flowing back look and make the collar style hackle much easier to wind on. I tied a few using Whiting’s new Spey hen feathers, I like the look but I haven’t been able to test that version yet. That’s it, body, rib and hackle, quick to tie. I took my father into the same pond a week later and he repeated my success with the new fly. He also noticed the savage strike and repeat hits even after a miss. I think the pattern will adapt well to other colored bodies so feel free to substitute. 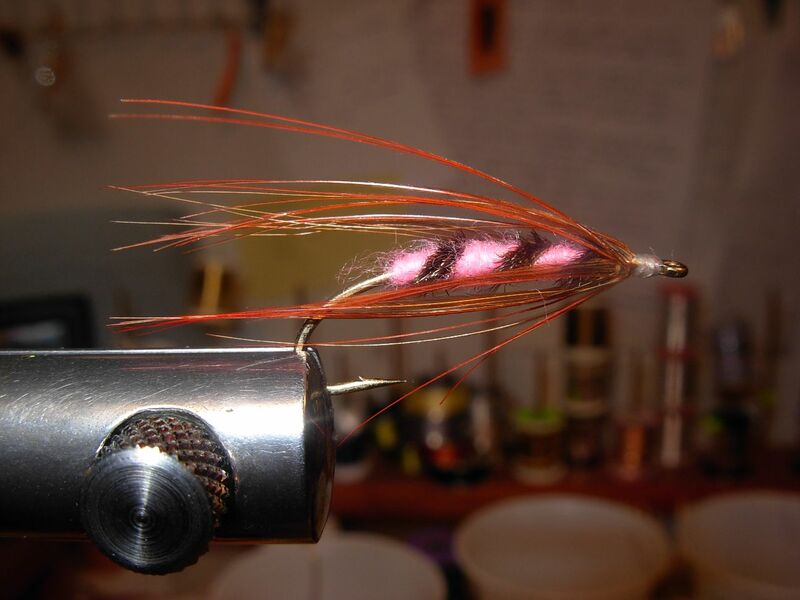 I get a lot of action on this fly in pink and also with an olive green body and black soft hackle. I refused to wear pink shirts in the 1980’s, I won’t eat pink food and I never paddle pink canoes. But I love this pink-bodied (or green) emerger. And if you should see me in the company of a long legged brunette with big eyes and obviously much younger than me, you’ll know where I got the name. Happy Birthday Honey! This entry was posted in Fly patterns and tagged emerger, fly tying, recipes, wet fly. Bookmark the permalink. Homepage of Ray Bondorew, author of "Stripers & Streamers"
Where fly tying comes to life!